Is it too much to ask the FDA for us to be free from ingredients that are harmful, addictive, and that can cause cancer in our food and in our personal hygiene products of such things!? Isn’t that what the FDA is supposed to do? To protect us against harmful chemicals and ingredients in our products? There is another type of freedom I’d like to talk about too. Freedom from a job. Were we made by the creator to work a job we dislike or even hate just so we can make a living and provide for our family? Were we not made to have freedom, and enjoy life to the fullest? I’m not talking about no work at all. Well..maybe for a little while anyhow, overall we have to have some type of purpose. Something that we can enjoy doing and making a positive difference in this world. I believe we are made more than to just survive. We are made to thrive. Have we given up on all our dreams, for the hum drum of living during the week, and just looking forward to our little one to two days off work. Our 1 week to 4 weeks a year of vacation? Big deal! All the rest of the weeks, working to fulfill someone else’s dream. That’s what most of us are doing. Working for fulfill someone (the boss, the founder) else’s dream. What about my dream and your dream? Are they less important than our bosses dream? 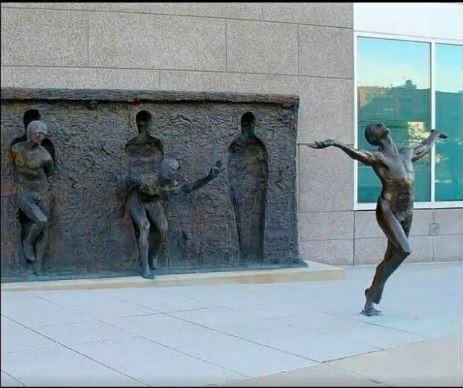 Granted not everybody has the guts to break out of the mold like depicted in this picture. Some will stay in it their entire lives, others will only dream about breaking out, but not break out, and those rare one’s that step beyond the fantasy, actually take action and do break out to their own freedom. Not just financial freedom, but freedom to live the way you want. Freedom to create, to be, to do, to have. Now let’s talk about another freedom beyond bad ingredients and bad jobs. Let’s talk about spiritual freedom. You see, no matter if you have the cleanest food to eat and the freedom to enjoy life with financial abundance, unless you are spiritually free, you are not free at all. People are made up of more than simple matter. (And thank God for that!). People have a spirit,a soul. I have found that the Holy Bible to be the inspired word of God and found Him, not only in the pages of the Holy Bible, but have found Him to be real and alive. More than a history figure, and more than a belief. As real as you and I. Alive, moving, and communicating to those who will only listen. Being forgiven of all your sins 100% is quite a feat! Yet God provided a way for us to be cleansed though His son Jesus the Christ. His son who was born of a virgin, lived as a man, yet without sin, and freely laid down his life paying the price of death so we would not have to. Death meaning separation from God. He made a way where there seemed no way. God truly loves us and wants the very best for our lives, both here while we live on Earth, and in Heaven of course with Him. Will you consider today, freedom in all these area’s and ponder how you can gain this freedom? How many people can wake up in the morning and do whatever they want to do for the day? Not many, right? Of course, the reason is because they have to go to work. The trouble there is that work is a drag! But, being an economic blister is even more of a drag! So, in order to avoid being broke, most people set off each day to a place called “work”. They not only have to show up every day of the week, but they are told how much money they will make, and when to plan their two week escape. They have become “wage slaves” and their lives are no longer theirs. Why do people do that? Certainly, it is not for financial gratification. How many millionaires do you know who became rich working at a job? I know some people who even have budgets! How sickening. Can you imagine a life of such predictability that you know exactly how much you are going to spend for the month on gasoline and toiletries? Snap out of it!! How are you ever going to get ahead if you plan on mediocrity? And people definitely don’t work a job to be happy. Why do you think so many people drink so much alcohol? No one can really be that thirsty! Why are so many people hooked on drugs? These can’t be the signs of happy people. Some people are so unhappy that they just kill themselves. Most people are not that desperate though, so they just comatose themselves in front of the TV every night. Wow! I have got to change the subject, because this is starting to get depressing. But, this is how most people live, and if you live like most people, you are going to be working all your life; broke and unhappy. If you follow the herd, you will become a cow just like all the others, chewing your food twice for excitement while you wait to hear what the government is promising to steal from others to give to you. The trick is don’t do what everyone else is doing. The individual who is financially secure, in charge of his or her life, and happy is uncommon. They are rare, but you can be one – a rhinoceros! The rhinos of the world are the thick-skinned chargers who enjoy the excitement of running their own businesses in the jungle, rather than following the herd of cows to the slaughterhouse. Rhinos buck the odds. They are willing to put themselves up against challenges and the taunting and criticism that taking a challenge brings, to avoid mediocrity. They are eager to struggle against the flow, in order to escape a commonplace existence that the cows all share. They are ready to risk losing, in order to win. This entry was posted in Ingredients, Living A Clean Life, Network Marketing and tagged breaking out of the mold, FDA, financial freedom, forgiven of your sins, forgiveness of sins, Freedom, freedom from a job, God, God loves you, holy bible, how to fulfill your dreams, Jesus Christ, Jesus the Christ, natural ingredients, pure food, spiritual freedom. Bookmark the permalink.